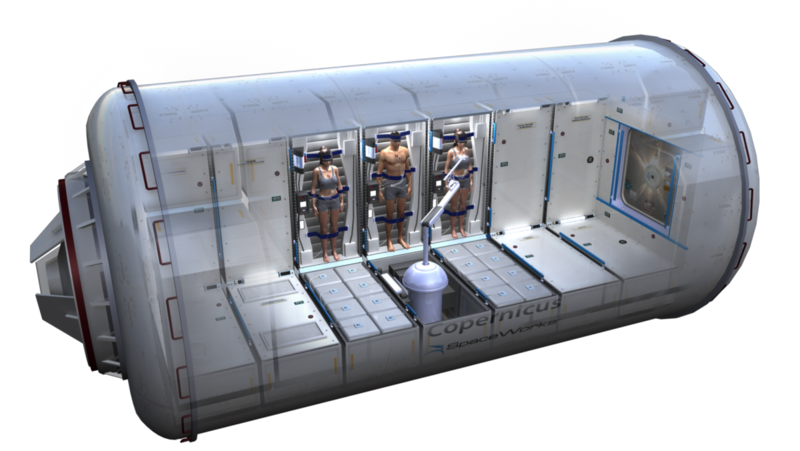 SPACE TORPOR: Preview of the baseline zero-G habitat! This habitat, styled after ISS modules, contains everything the crew will need on a conjunction-class Mars mission (180 days out/back with contingency for failed surface trip). It is about a fraction of the total volume of the DRA 5.0 Mars TransHab and weighs less than half. This is our baseline that fits within the rest of the DRA 5 architecture requirements and mission. We are currently working up an even smaller option to further reduce the mass and volume, as well as be more conducive to an artificial gravity environment (i.e. rotating). The DRA 5 approach does not employ an artificial gravity system.